Here are 7 proven tips for moving customers out of a hardball mentality into a constructive dialogue. Confidently acknowledge and address anger. A big mistake among customer service professionals is to ignore a customer’s expression of anger or tip-toe around it. There is something known as the communication chain. When people communicate, they expect the person they are communicating with to respond or react…this response is a link in the communication chain. A failure to respond to communication leaves the communication chain unlinked…broken.For example, If I walk into my office and say… “Hello Sherry, how are you?” ….and she says absolutely nothing, she’s broken the communication chain. And that leaves me feeling awkward, perhaps embarrassed.If a customer expresses anger and we fail to respond to it, the communication chain is broken, and the customer feels like they are not getting through. The customer might become even angrier and more difficult, as they are resorting to whatever it takes to feel heard and understood. You can keep your angry customers from getting more upset by confidently acknowledging their anger and responding to it. You can respond to anger with a statement like, “Clearly you’re upset, and I want you to know that getting to the bottom of this is just as important to me as it is to you.” This statement directly and professionally addresses anger – without- making the customer even angrier. Now that the anger has been acknowledged, you have completed the communication chain. 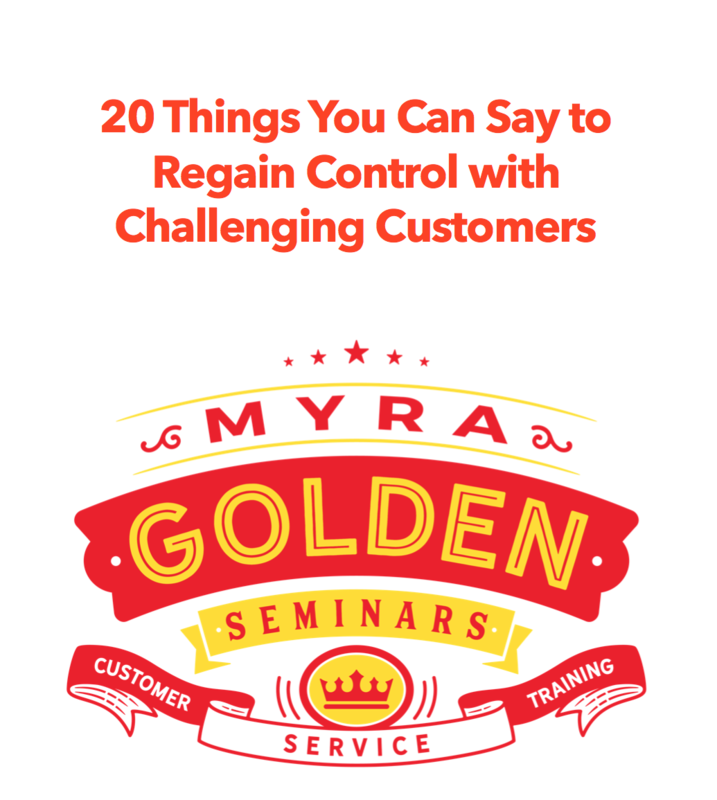 Allow the customer to vent, but don’t lose control. An Angry customer can be compared to an erupting volcano. When a volcano is erupting, there is nothing you can do about it. You can’t speed up the eruption, you can’t put a lid on it, and you cannot direct or redirect it…It must erupt.When a customer is angry, they must experience and express their anger – and often this is done through venting. We should not interrupt an angry venting customer or tell them to “calm down.” This would be as futile as trying to tame a volcano. A volcano erupts and eventually subsides. Your angry customer will vent and eventually calm down.Always let angry customers vent. In most cases, your customer will only need to vent for fifteen to thirty-five seconds. Venting beyond 35 seconds can become ranting and cause you to lose control. After a few seconds of venting, you’ll want to jump back in and move the conversation forward constructively. It can be easy to lose our cool when a customer gets hot, but be warned: In most cases, showing frustration, impatience, or acting even mildly upset doesn’t help you move the customer out of a hardball mentality. Usually, losing our own cool does nothing but make the customer even more upset, or our attitude will make the customer even firmer in his original position.If you feel you’re beginning to lose your cool, don’t be afraid to hit the “pause” button. You hit the pause button by putting a customer on hold or telling the customer you will call them back. Heed Steven Covey’s Words…Understand, then be understood. What are the chances you’d go back to a doctor that prescribes a solution without even diagnosing a problem? You don’t have much confidence in someone who doesn’t diagnose before they prescribe… But how often do we prescribe a solution before completely diagnosing the situation, in dealing with customers?Seek first to understand. Before you try to PRESCRIBE a solution for a customer’s problem before you quote policy or tell a customer what you cannot do, seek to actually understand the customer’s viewpoint. How has the problem impacted your customer? Has your customer lost money, time, respect, or confidence because of this issue? Does the customer feel embarrassed, wronged, discriminated against, or powerless? Try to really understand what your customer is experiencing and feeling. when you respond, communicate your full understanding of the problem from the customer’s perspective. Only then can you truly diagnose, BEFORE you prescribe a solution. Listening with the intent to understand gives you empathy for the customer and puts you in the position to solve the real issues. Once you really understand your customer, you naturally begin to communicate with empathy and to communicate more efficiently. Your customer, who feels understood, can now start to understand you. Don’t belabor your point…no matter how right you are. be•la•bor – [bi-ley-ber] – verb: (1) to assail persistently, as with scorn or ridicule (2) work at (something) repeatedly or more than is necessary: He kept belaboring the point long after we had agreed.If you really want to tick a customer off or incite an already upset customer, belabor your point. Repeat your point (your policy; your position) over and over again. I mean really badger the customer with your elementary explanation so that the customer feels they aren’t too bright. Customer service professionals all around the world make the mistake of belaboring a point when speaking with customers. Don’t let this happen to you. Only make your point once diplomatically and then enter into a constructive dialogue with your customer. When a person says “no,” all of their pride demands that they remain consistent with themselves. And it is very difficult, once they’ve said ‘no,’ for them to change their mind and become “agreeable” with you because their sense of pride is now involved. And we invest so much in our pride.Here’s how it works. Build an affirmative path by asking your customer two straightforward and obvious closed-ended questions that you know will result in a YES response. Once you do that, the customer will be on an affirmative path (with you), and it is far easier for them to agree with your next question. It’s very much psychological…Your customer won’t feel comfortable disagreeing with himself…and will feel compelled to say yes to your third question so that he agrees with himself!